C. W. Gortner has once again taken a controversial historical figure and made her into an admirable protagonist. Like Juana from The Last Queen, Catherine de Medici has not enjoyed a plethora of novels depicting her in a positive light. From Jean Plaidy’s trilogy (Madame Serpent, The Italian Woman and Queen Jezebel) to The Devil’s Queen by Jeanne Kalogridis to Susan Carroll’s Dark Queen series you can find much fiction based around this Italian born French queen, but none quite give Catherine a chance at being a reasonable woman and meritable monarch. Until now. If you’re looking for just another novel on a murderous, power-hungry queen, this is not your book! 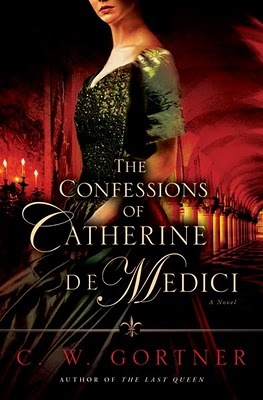 In The Confessions of Catherine de Medici you will find a stalwart, determined woman who looks beyond her heart’s desire to protect her acquired realm. Beginning with a depraved childhood where she was once sheared and nearly starved to death in a destitute convent, Catherine had to make her way without parents or even siblings to guide and comfort her. Her only surviving relation happened to be the Pope—an uncle who planned to use her as the last Medici pawn in his power. Catherine was resigned to a marriage with France and accepted her fate with a quiescent grace. This attitude would serve her well as she transformed from duchess to dauphine and queen to queen mother. Though her life with Henri (France’s King Henri II) seemed severely abridged in this novel, I believe it only seems that way to me because I’ve read Courtesan by Diane Haeger, which focuses on Henri and his mistress Diane de Poitiers and gives every small detail possible. In fact, The Confessions of Catherine de Medici focuses more on Catherine’s role in her children’s lives after Henri’s demise and her importance to French politics and the monarchy. Though Catherine has visions, they are vague and not very frequent. I thought this added the right touch of mysticism without giving an onslaught of the occult as with other novels on this particular queen. There is poisoning, but Catherine is not actively involved, nor does she order the murder of anyone in the way of her ambitions. However, it must be noted that she is very human, and as such makes mistakes and learns from them. The dynamics between the Valois kings, the Duc de Guise and Henri of Navarre and the conflict between the Catholics and the Huguenots make up the greater of the book and was a great refresher for me, as I read a novel on Navarre (Evergreen Gallant by Jean Plaidy) and enjoyed learning about the particular religious strife in France during this time. Though extremely sympathetic to the protagonist, I felt this to be a refreshing, much deserved perspective on a frequently maligned queen.